Peter Duffie is a Con Artist? Annual competition Fame and fortune may be yours! Annual competition results. Are you rich and famous this time around? An ordinary kids' party for Henrique!!!! This year's competition. Your chance for fame and fortune? Magical event diary, make sure that your society is firmly on the magical map. Mrs Breedon is revealed on all fours with an apple, some lettuce and a tortoise! Magical Event Diary. Put your society on the map for free. Details of this year's competition. Your chance for fame and fortune? Unclassified Ads. Sell buy and swop. Free! Magic Society news. Is your society on the map? Collector's Corner edited by Eddie Dawes with news of a magic prop scheduled to sell for $150,000!! 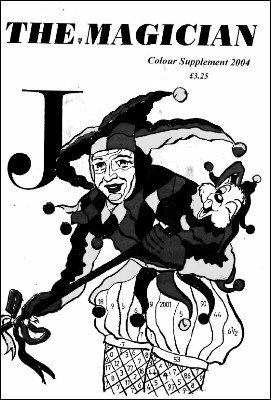 John Rhodes rounds off this issue with all the magical news in the lay press. Jim Breedon ponders on memories of our fragile heroes ... and a Switch Pad.